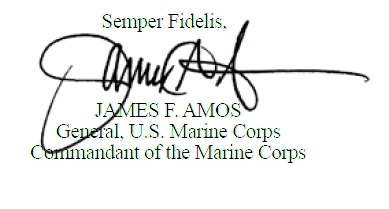 These are words some experts used to describe Marine Corps commandant Gen. Jim Amos–or at least, how they believe his signature describes him. Writing for MilitaryTimes’ Off Duty section, handwriting experts Sheila Lowe, Kimon Ianetta and Reed Hayes took a look at the John Hancocks of all the military service leaders, including the Commander-in-Chief. President Barack Obama’s mostly-illegible signature “signals a strong need for privacy,” Lowe said, while Army Gen. Martin Dempsey, chairman of the Joint Chiefs of Staff, is “unable or unwilling to tell it like it is” judging from his autograph, she said. As for the CMC, analysts looked at the “sharp angles and extended hooked final stroke” to determine what the signatory said about the man. Iannetta and Hayes came up with a slightly different but complementary analysis of the signature. Do you think this analysis is spot-on or a little suspicious? What do you think the signature says? To read the full story with full analysis of all the service leaders’ signatures, and that of Military Times staff write Jon R. Anderson, pick up a copy of Marine Corps Times on news stands today or get the full print version online with a one-day pass on MarineCorpsTimes Prime. I just wasted 30 seconds of my life reading this useless article. I think it says… “I don’t know how to stand behind my men… and once I make up my mind to sc*w the… I will not back down no matter how any justice laws I need to break to do so”. So I guess that is pretty close to the first one. Gen Amos is Strong willed, very motivated, and capable as a Commander. He is narrow minded and beligerant in his view of his own Integrity, while unable to make the right decisions for the men he should be protecting, not “crushing” them for Minor infractions.